‘The Coach House, Thornbury, which has just been acquired by the Thornbury RDC from Mr. Francis Hopkins is, I understand, to be demolished under the plans for the Thornbury Central Redevelopment scheme. This is in many ways a pity for Coach House has had a varied and interesting history. Its deeds go back to 1733 and in its time the premises have been used as a black­smiths, a coal wharf, a small holding, a farmhouse and later for a carrier’s and haulage business. The first horse-drawn carriage for passengers from Thornbury to Bristol started from the premises. The first carrier service used to leave Thornbury one day, put up at the Full Moon near the Horsefair in Bristol for the night and come back to Thornbury the next day. It was this which led Mr. Hopkins to name it ‘Coach House’ when he acquired, restored and renovated the premises in 1955. 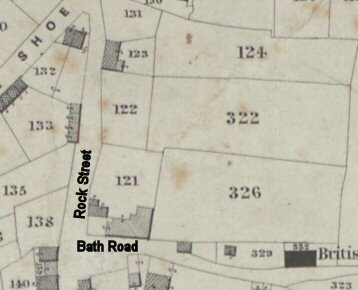 We are grateful to South Gloucestershire Council for allowing us access to the deeds and documents that relate to the property that became 1 Bath Road. These confirm the origins of this house and give us a detailed history from the Eighteenth Century and suggest the property was used an orchard and cider mill for many years before that. John King and the Thurston family. By two indentures of 1770 (dated 23rd of January and 30th of January respectively) John King a clothier of Wickwar sold the land on which 1 Bath Road later came to be built. John King had inherited this land from his late mother Grace, the daughter and heiress of of John Thurston who in turn had inherited it from his father, Robert. Robert Thurston was born about 1655 and died aged 58 on 26th October 1713. This property shares a common history with part of the High Street that was also owned by the Thurston family and then the Kings. The indenture describes the property as containing a mill house and orchard. Read more about this early history. Thomas Grove. The purchaser of the property in 1770 was Thomas Grove a butcher of Thornbury who bought it for £84 and the indentures describe the property as a mill house and orchard, “containing by estimation one acre.” The transaction is confirmed by the Assessment for the Relief of the Poor of 1770 that says Thomas Grove had to pay 1 and 1/4 pence for “the Cyder Mill and orchard, part of Kings.” Thomas Grove seems to have made a wise investment or else he had improved the property in some way as the value seems to have increased considerably in seventeen years. On 17th January 1787 Thomas Grove butcher and Anne his wife sold to Hester Wetmore a spinster for £150 “all that mill house, cider mill, cider press and orchard .. containing by estimation one acre bounded on the north by lands in possession of Ralph Grove …. and were at some time past had and purchased by him the said Thomas Grove and his heirs in fee simple from John King clothier since deceased.” It is noteworthy that not only had Thomas sold at a profit but he had sold to family. His wife Anne, whom he had married on 29th November 1767 had previously been Anne Wetmore, the daughter of John Wetmore and so she was Hester’s sister. Thomas was baptised in 1743, the son of John Grove and his wife, Ann. Thomas and Anne had at least five daughters and five sons; Sarah born on 17th September 1768, Elizabeth born 31st December 1769, Ann born 28th January 1771, William born 5th March 1772 who died aged 8 months and was buried on 2nd January 1774, Esther born 9th June 1773, Maria baptised on 15th March 1775, Thomas born on 25th April 1776 and baptised on 5th June 1776, John Wetmore born on 24th August 1777 and baptised on 24th September 1777, Samuel born on 28th March 1779 and baptised on 19th May 1779 and their tenth child, appropriately named Decimus born on 29th September 1780 and baptised on 18th October 1780. It is astonishing that at a time of high infant mortality only one of their ten children died young. Thomas’s mother Ann died on 29th January 1764 aged 60 and his father John, also a butcher died on 25th July 1770 aged 71. Thomas was Mayor of Thornbury in 1779/80. We believe that Thomas Grove died January 1788 and his widow Anne Grove died 15th March 1796 aged 51. In Anne’s will she left her house at 5 Silver Street to Thomas and Anne on condition that they live there and allow any of her other children to live there. Her personal was estate to be divided between all her children, but in a codicil she left out Thomas and Anne. William Scott and his wife Hester (nee Wetmore). Hester Wetmore bought the property in January 1787 before her marriage on 23rd June 1788 to William Scott Bird. 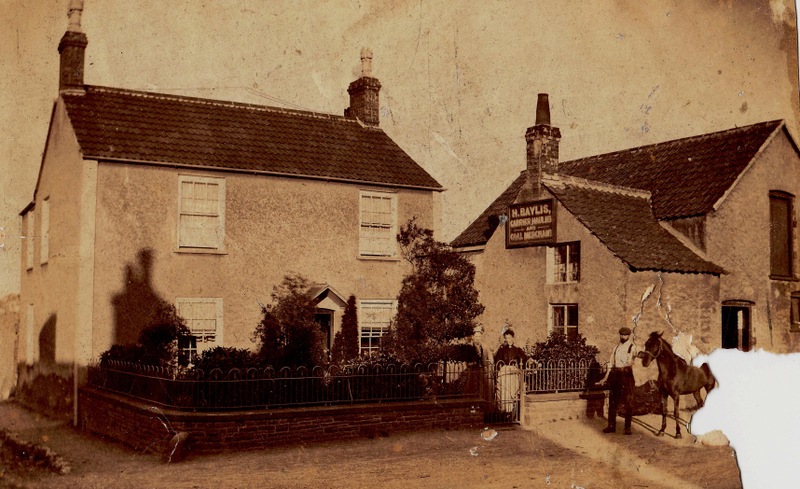 William was an apothecary and surgeon in Thornbury and also owned 13 The Plain. Read more about William and Hester (or Esther) Scott. Thomas Osborne Wetmore. The 1840 Tithe apportionment shows that this property was Plot 121 and it was a house and garden owned by Thomas Osborne Wetmore and occupied by Joseph Williams. Thomas attempted to sell off several of his properties in 1855, including the one in Bath Road – it was described as ‘a roomy and well-built freehold cottage with walled garden, blacksmith’s sheds and other outbuildings adjoining, situate in Back Street for many years in the occupation of Mr Joseph Williams’. It seems that the property failed to sell as following Thomas’s death in 1868, the property was put up sale at auction again – it was then described as ‘all that freehold dwelling house with large walled garden, blacksmith’s shop, storehouses etc, situate and being at Back Street and Balseys Lane in the occupation of Mr Hignell or his under-tenant’. On 14th April 1869 his sons, George Osborne Wetmore of 61 Kingsdown Parade in Bristol and Thomas Philip Wetmore sold the property that had been a Mill House. It is clear that the building had changed again by the time of the sale as it seems it had been converted from two messuages into one with a blacksmith’s shop. George Werrett. On the 14th April 1869 George Osborne Wetmore of 61 Kingsdown Parade esquire and Thomas Philip Wetmore sold to George Werrett of Shepperdine esquire the messuage and property that now included a blacksmith’s shop. George Werrett was born 22nd April 1811 and was the son of William and Virtue Werrett. On 5th June 1842 George married Sarah Ball, the daughter of William Ball. George became a farmer in Shipperdine, where he farmed about 110 acres and the Census of 1851 shows that he lived there with his wife Sarah and their four children; Virtue aged eight, George aged five, Sarah aged four and Ellen aged two. By 1891 the widowed George was living at Camp Farm in Oldbury. Kate, Elsie and Ralph Baylis. On 24th June 1919 the trustees of Henry Baylis, Walwin Baylis and George Tucker having had the property valued in accordance with Henry’s wishes sold the property at 1 Bath Road for £625 to three of Henry’s children, Kate Baylis a spinster, Elsie Baylis a spinster and Ralph Baylis a carrier. We have been told by Ann Fynn, a member of the family that during the period the house was owned by the Baylis family, it was known as ‘Rock House’. We have not found any reference to that name in any documents. 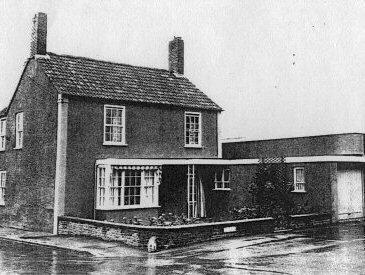 The property stayed in the Baylis family until 16th August 1956 when Robert Baylis of Middlesex and Albert Baylis of 23 Pullins Green sold 1 Bath Road to Francis George Hopkins of 18 High Street. This ended the link the Baylis family had with this property. When the property was put up for sale in 1956 it was described as: Ground floor comprising front sitting room and back living room, kitchen and pantry. First floor comprising four bedrooms. Covered courtyard to lean-to larder, wash-house with boiler, and W.C.
Thornbury Rural District Council demolished the property and it is now part of Rock Street car park.